As business people it would be great if we could deduct 100 percent of all of our business meal and entertainment expenses from our taxes but unfortunately the full 100 percent deduction is rarely applicable. This guide explains both the general rules for deducting food, beverage and entertainment expenses on Canadian income tax and those special situations where a 100 percent deduction can be claimed. 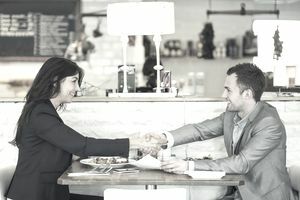 And while this article deals with food and entertainment expenses as they apply to business people and professionals, the 50 percent limit also applies to the food and entertainment expenses of employees, such as the expenses of commission salespersons and the traveling expenses of employees ordinarily required to work away from the employer’s place of business. The entire amount of $51.20 is subject to the 50 percent rule and you can claim $25.60 as a business expense. 2) You are traveling by plane, train or bus and the cost of meals, beverages, and entertainment is included in the travel fee. It's a different case if you’re traveling by ship, boat or ferry, though; in that case, you can only claim 50 percent of any food, beverages and/or entertainment. 2) The second is that if you attend a convention, conference or seminar where you are provided with meals or entertainment, and no amount of the fee you pay is specifically allocated to the costs of those food, meals or entertainment, you must claim $50 a day as an entertainment and meal expense – but this is subject to the 50 percent limit, so in reality, you can only claim half of this amount, or $25, each day. And note that “the fee for the conference, convention, seminar or similar event is deemed to be the actual fee paid or payable minus the amount deemed to have been paid or payable for food, beverages, and entertainment” (CRA) – meaning that your food and entertainment claim has to be deducted from the conference fee. For example, suppose you pay $1,200 to attend a two-day business management conference. There’s no specific reference to the cost of food or entertainment in your registration fee, but you are provided with breakfast, lunch, and dinner each day. Long-haul truckers can claim 80 percent of the food and beverages they consume during eligible travel periods (a period of at least 24 continuous hours away from where they live and transporting goods at least 160 kilometers away). Self-employed foot and bicycle couriers and rickshaw drivers can claim 100 percent of the extra food and beverages they need to consume in a normal eight hour work day (or, for 2006 and later tax years, a daily flat rate of $17.50). Some expenses that would qualify as entertainment expenses are obvious – the costs of tickets for performances or sporting events or the cost of renting a hospitality suite. You may also wish to refer to their Convention Expenses. If you are operating your business as a corporation, you will claim meals and entertainment expenses under operating expenses (8523) when you are using the General Index of Financial Information (GIFI) to complete your financial information statement on your T2 corporate income tax return.